Set in the near future, The Resistance pits a small group of resistance fighters against a powerful and corrupt government. The resistance has launched a series of bold and daring missions to bring the governement to its knees. Unfortunately spies have infiltrated the resistance ranks, ready to sabotage the carefully crafted plans. Even a single spy can take down a resistance mission team, choose your teams carefully or forever lose your chance for freedom. 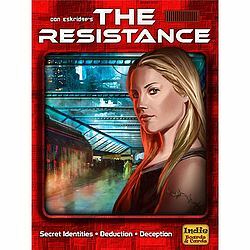 The 2nd Edition of The Resistance features upgraded components with the same great game play and same low price. These upgrades include thick tokens for voting and tracking players on the mission. The game also includes 6 tableaus, one for each player count, with incredible illustrations.